The Dallas Mavericks are famous for a few reasons. They are the ninth most valuable basketball Franchise in the NBA valued at $1.4 billion dollars. The other unique aspect of the team is Mark Cuban their highly involved and enthusiastic owner. The Dallas Mavericks Chief Technology Officer–interviewed in this podcast–is used to hearing from Cuban whether it’s about engaging digital fans or a customer complaint Cuban found on social media. Management of the team make customer experience excellence a habit. The Dallas Mavericks continually invest in technology in addition to other leadership development practices such as the Disney Institute to maintain a strong level of quality throughout the Mavericks fan experience. Today’s Modern Customer guest, Chief Technology Officer Ken Bonzon talks about how he started his career with the Dallas Mavericks 17 years ago and the many transformations he’s seen the team go through. Fan engagement has always been a priority for the team, and now with technology engaging partners and fans has become even easier. 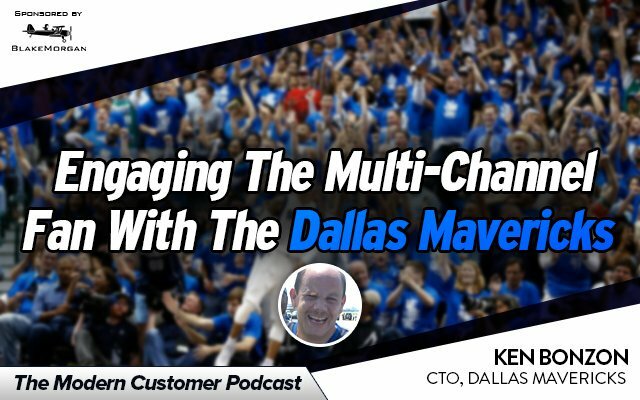 Learn about what the Dallas Mavericks are doing to engage fans and maintain brand relevance in this podcast. « What Makes Amazon’s Customer Experience The Best?